Notre Dame computer science associate professor Nitesh V. Chawla and his doctoral student, Darcy A. Davis, developed the system called Collaborative Assessment and Recommendation Engine (CARE) for personalized disease risk predictions and well-being. At the heart of CARE is a novel collaborative filtering method that captures patient similarities and produces personalized disease risk profiles for individuals. Using what is known as Big Data science, the system generates predictions focused on other diseases that are based on Big Data from similar patients. “In its most conservative use, the CARE rankings can provide reminders for conditions that busy doctors may have overlooked,” Chawla said. “Utilized to its full potential, CARE can be used to explore broader disease histories, suggest previously unconsidered concerns and facilitate discussion about early testing and prevention, as well as wellness strategies that may ring a more familiar bell with an individual and are essentially doable. Chawla points out that the core premise of CARE is centered on patient empowerment and patient engagement. Chawla believes the timing is right for CARE given changes in health care, reimbursement, reform, meaningful use of electronic health care data and a mandate for patient-centered outcomes. CARE has been awarded a U.S. patent. A paper by Chawla and Davis describing the CARE system appears in the Journal of General Internal Medicine. 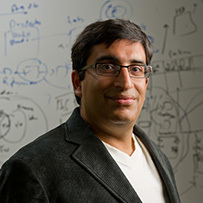 Chawla is the Frank Freimann Collegiate Associate Professor of Computer Science and Engineering and director of the Notre Dame Interdisciplinary Center for Network Science and Applications.